Often, we hear from parents who worry about young athletes who are hard on themselves, become easily frustrated, and take disappointment home with them. You’re likely familiar with these types of athletes. They’re perfectionists or athletes who display perfectionistic behaviors. Perfectionistic athletes criticize themselves for making mistakes, often hold very high expectations for themselves, and get frustrated easily after making mistakes. All three of these go hand in hand. On the positive side, these athletes have a strong work ethic, are committed to their goals, and want to learn and improve. In fact, most athletes display at least some “perfectionistic” traits in their practice from time to time. Even though they love to work hard in practice, it’s not always easy for perfectionist athletes to perform up to their abilities. When kids try to be perfect, they can undermine their own talents quickly. They hold strict expectations about their performance, are afraid of failing, and worry too much about results—statistics, goals scored or wins. If your young athlete is a perfectionist, begin by identifying the traits that may be sabotaging his or her confidence in competition. Does your child want to win so badly that he feels anxious? Is your athlete afraid of failing or losing? Does he or she play tentatively during games? Does your athlete try too hard and then over-control his or her performance? 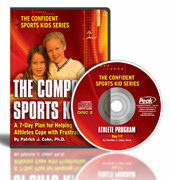 Parents with perfectionist athletes should help kids identify their high expectations about how they should perform. Then help your child or teen replace these expectations with simple process goals. For example, say your athlete believes he or she should hit every shot perfectly. Suggest that your child replace his or her “I must hit every shot perfectly” mindset with these simple process goals or objectives: 1. Pick the right target for each shot 2. Be decisive 3. Be confident. Simple tasks your child can manage easily. Reward the positive behaviors related to perfectionism such as not accepting mediocrity. However, you should be mindful of the subtle ways that perfectionist athletes undermine their confidence and happiness in sports.